Ajahn Pasanno took ordination in Thailand in 1974 with Ven. Phra Khru Nanasirivatana as preceptor. During his first year as a monk he was taken by his teacher to meet Ajahn Chah, with whom he asked to be allowed to stay and train. One of the early residents of Wat Pah Nanachat, Ven. Pasanno became its abbot in his ninth year. During his incumbency Wat Pah Nanachat developed considerably, both in physical size and in reputation. Ajahn Pasanno became a well-known and highly respected monk and Dhamma teacher in Thailand. Ajahn Pasanno moved to California on New Year's Eve of 1997 to share the abbotship of Abhayagiri. 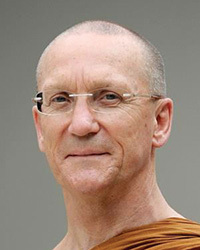 In July of 2010, when Ajahn Amaro returned to England to assume the duties of abbot of Amaravati Monastery, Ajahn Pasanno assumed the role of sole abbot of Abhayagiri. View Ajahn Pasanno's upcoming programs.